Healed by Metal isn’t without its head-banging moments. Palm-muted, metallic riffs with driving drum beats abound. Tracks like “When Night Falls,” “Call for War” and “Ten Commandments of Metal” will satisfy a fan’s metal-plated heart. The truth is, however, all of these songs have been written before. We’ve heard these riffs, head-banged to these beats and blown out our stereos out with the pummeling bass. We’ve heard better, more focused and less absurd versions of all of it. Metal has been around a long time, and while many bands can add new twists on old sounds to make things fresh, Grave Digger can’t pull it off. Metal cliché after metal cliché is exploited to hilarious degrees on Healed by Metal. If there’s one thing we already know it’s that heavy metal already borders on ridiculous, while remaining just serious enough to stay respectable. But it’s a fine line, and Grave Digger took a running start at it only to soar over it like an Olympic pole vaulter. “The Hangman’s Eye,” for instance, takes another shot at the tried and true heavy metal concept of medieval execution (which, by the way, is as overdone as truck drivin’ and beer drinkin’ is in country music). Whatever metaphor Grave Digger may have been attempting—if they were taking a shot at all—is hanged without trial with lyrics like, “Hey hey the hangman’s eye/ Hang your head high in the sky/ Death, death will never lie/ Let me live or let me die/ The hangman’s eye.” It may not be fair to take shots at metal lyrics, but come on, when trying to find something, anything to fully enjoy on this record, this tune gives that effort a swift kick in the pants. If you want a metal album, this is a metal album. If you’re indiscriminate as to the quality of your heavy metal, this is a heavy metal album available for purchase. If you lend a critical eye to all of your music including your heavy metal, skip this one. Finally, if you’re a Grave Digger fan, well, sorry. 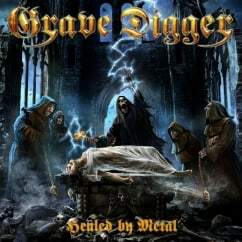 Even the most righteous riffage on Healed by Metal is unable to dig it out of the grave the band has dug for themselves. If that seems a bit on the nose, that’s exactly how silly Grave Digger’s newest effort is.